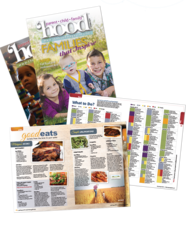 The 'Hood is a resource magazine for local families who value spending time together. 'Hood is short for parent-hood, child-hood, mother-hood, father-hood, or even grandparent-hood — all the 'hoods for all the stages of family life, because, if you're in the 'hood, you play a role in family togetherness. If you like this audience, we can help you reach them! Call (605) 366-1479 for more information. A. Full Page Bleed: 6.625" x 9.625"
Full Page No-bleed: 5.875" x 8.75"
Illustrator®, Adobe Photoshop®, and QuarkXPress 7.0.
if artwork is not submitted press-ready. Images must be 300dpi and saved in tiff or eps format. happy to help for an additional fee. Inquire for more details. 'Hood is also distributed in 14+ daycares in the area.